An Open Day for everyone interested in playing tennis. Minis from 9:00 a.m. - 10:100 a.m.
9 ys-10 yrs from 10:15 - 11:15 a.m. Adults and families from 1:00-4:00 p.m.
Beginners through to team players. Games, Challenges, Speed Gun, Rebound wall. A great day of tennis for everyone at Andover's modern, purpose built facility, with indoor courts. The weather doesn't matter! The Wimbledon Ticket Ballot Night at ALTC will be held on Wednesday 24th April at 7:30 p.m. in the clubhouse. a fully paid up member (Adults and Juniors 11-17 years old) of ALTC for 2019-2020. 'opted in' to the Wimbledon Ballot through British Tennis (by February 2019). Please contact Tina if you are unsure if you have opted in. a British Tennis Member and ALTC is linked as the venue to the membership record. 11 years of age or older. The ticket and price lists are also displayed on the Clubhouse noticeboard. Please click to view the BTM Venue Ballot Rules. We recently held an Adult Doubles Masterclass session for our adult members. Josh, the Club’s Head Coach gave the two hour session which was full of helpful tips for doubles play. The session was followed by a lunch prepared by the Catering Team . Easter camps are being held throughout the Easter Holidays for children aged between 2 - 15 years old. For further details contact Josh via info@jgtennis.co.uk or book via www.clubspark.lta.org.uk/AndoverCoaching . Well done to Joey for being selected the ‘Player of the Month’ by Josh and the coaching team. The Club’s winter programme of matches has resumed after a short Christmas break. In the Basingstoke League the men’s A team had a straightforward win over Old Basing B. Shaun McDonald and Al Williams won both matches 6-1, 6-1 and 6-1, 6-2. John Cadwell and Gregor Corcoran also proved too strong for the opposition winning 6-1, 6-0 and 6-1, 6-1. They then took on local rivals Goodworth Clatford. This was a closer match with Al Williams and Shaun McDonald winning three sets and Gregor Corcoran and Adrian Shapter winning two, to give them a 5-3 win overall. The men’s B team has relied on youth and has given first senior matches to several of the club’s talented youngsters. Brothers Tommy and Mark Mackie helped the club to promotion last season and Kyril Kennett has played a lot of matches. Myles Cole is the latest junior to join the team. Myles, Kyril and Mark are fourteen years old. They need to be consistent and strong to hold their own in a senior match as well as having to cope with styles less coached than their own. Myles and Kyril played their part in beating Old Basing B at Old Basing. They won both matches 6-2, 6-1 and 6-1, 6-4. Gareth Banning and Jacob Webb halved one match 6-7, 6-2 and won the other 6-0, 6-0. The team found it harder against Old Basing A at Andover’s Indoor centre, but they put up a good show. Myles and Kyril faced the Basingstoke Singles Champion in the first pair but had some superb rallies of professional quality. The Old Basing pair had more consistency at that level and won 6-0, 6-2. The boys were not downhearted, however, and had a close match against the second pair sharing the sets 6-4, 2-6. Adrian Shapter and Thomas Foster did well against the second pair, winning 7-5, 6-2 and put up a good show against the firsts but went down 3-6, 3-6. This was a loss by 3-5 overall, but a great effort against a good team. The A team are due to play the Old Basing A team so this should be a good test for them. Each year, ALTC is allocated Wimbledon tickets which are balloted at a Club meeting, which normally takes place in April. The registration process is now open for Adult club members (plus juniors aged 11 years old and above) to opt-in for the Wimbledon 2019 Ticket Ballot. *Note - You must be a British Tennis Member as well as a ALTC Club Member to be eligible to enter the ballot. Once logged in it will automatically re-direct you to the Wimbledon Opt-in page and then follow the instructions. IMPORTANT - Please remember to check your ‘Personal Details’ are up-to-date plus ensure ‘Andover Lawn Tennis Club’ is selected under ‘Your Venues’ otherwise you will not be eligible to enter the ballot. This is a 2-step process - first you need to ‘Become a British Tennis Member’ which is free for the ‘Lite’ category as you are an ALTC member. Then you need to ‘Opt-In’ to the Wimbledon Ballot’. IMPORTANT - Please remember to check your ‘Personal Details’ are correct plus ensure ‘Andover Lawn Tennis Club’ is selected under ‘Your Venues’ otherwise you will not be eligible to enter the ballot. Remember if you want to enter the ALTC Wimbledon Ticket Ballot you must ‘Opt-in’ by 22nd February 2019. It gives you a chance of being successful in the Club Ballot to watch the World's top tennis players at Wimbledon. Further information regarding the ALTC Wimbledon Ticket Ballot evening will be published in March… In the meantime, if you have any queries or experience any problems registering or ‘opting in’, please contact/email Tina, Margaret or Linda . 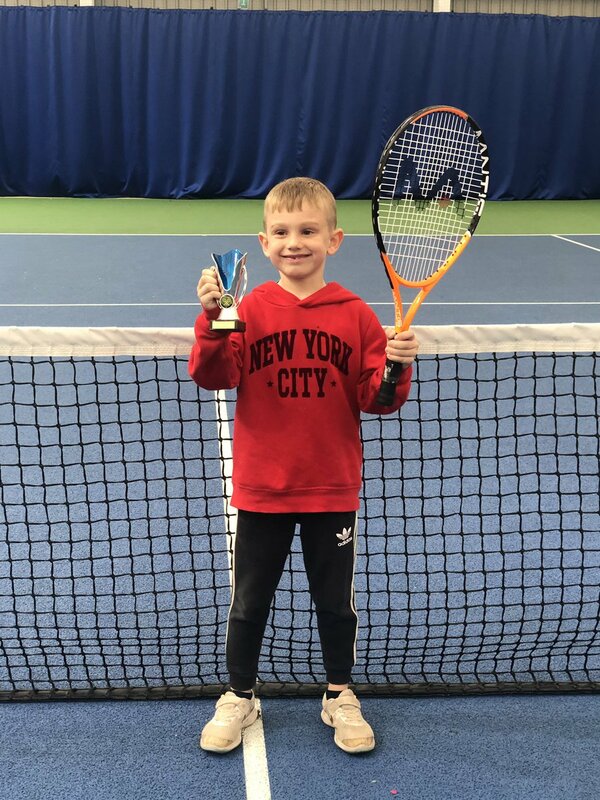 Great wins for local club players at LTA tournament..
Josh, our Head Coach organised a LTA Adult Tournament on 19th January. Entries were received from across many counties and competition was strong. 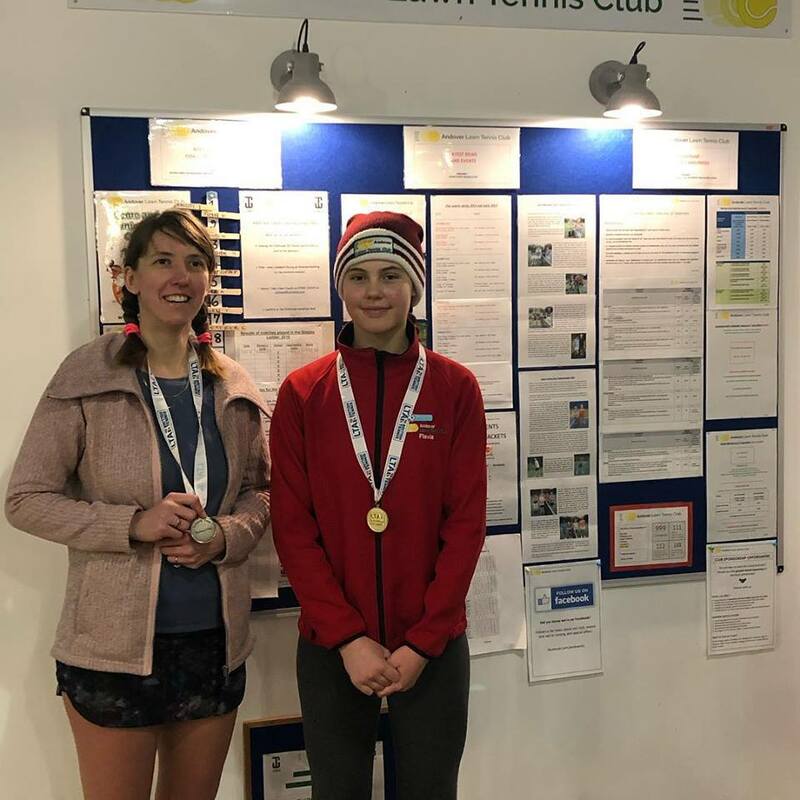 Our talented junior, Flavia, who is a team player for the H&IOW County Under 14 Girls squad, competed hard and won the Ladies event. Sam, one of our Club coaches won the Mens Event after a long hard fought final against his brother!! A great match played by both. Thank you to all the players, supporters and the volunteers who prepared refreshments throughout the event. More tournaments for all ages are planned throughout the year. Please contact Josh for more details or have a look on the LTA website for local tournaments. In the afternoon, why not pop along and support our Adult team who are competing against another local club. Play starts at 1.15pm. Refreshments available all afternoon… Alongside this, is an Adult LTA tournament being held from 2.30pm onwards – players from across the region are competing – some club members too… Apologies due to the busy court schedule, the afternoon member social play is postponed just for this Saturday. 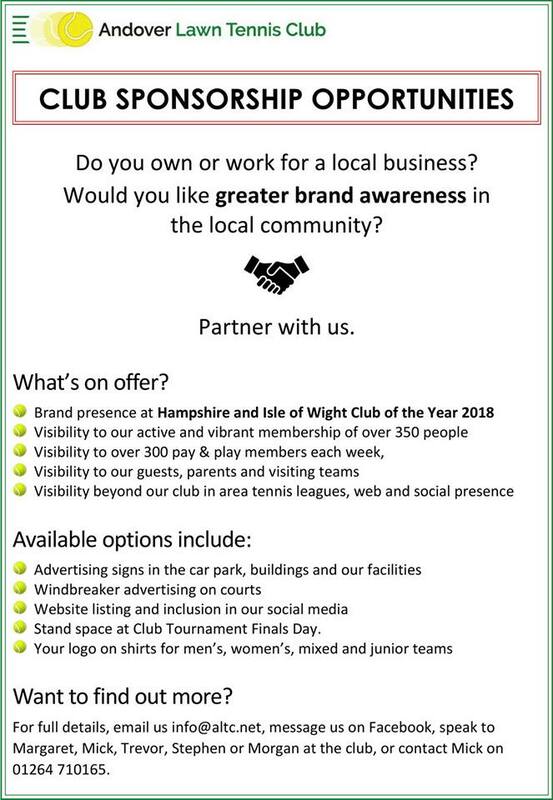 It’s a great time to be a club member - if you know of a friend, family member or work colleague who would like to join please email Tina. 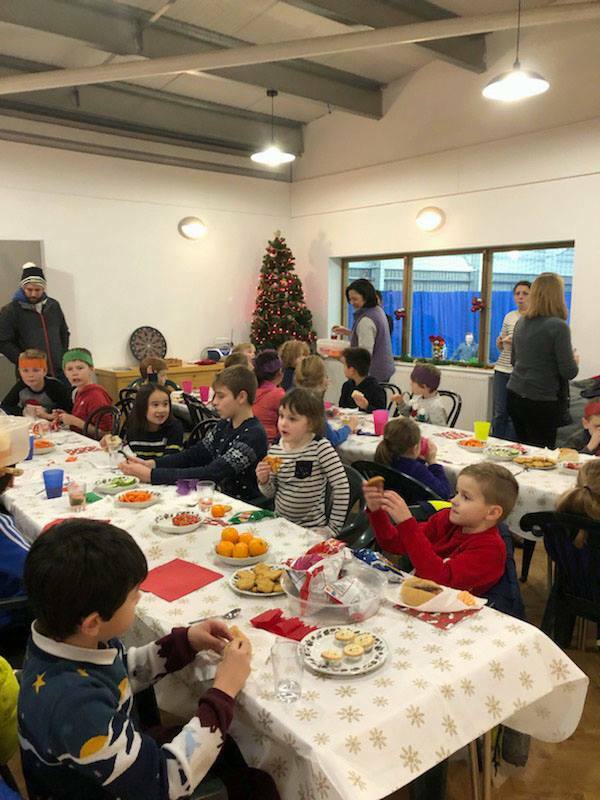 A festive time was enjoyed by everyone that attended this year’s Adult and Children’s Christmas Parties. A big thank you to everyone that helped organise the event and helped on the day/evening. The Club has been awarded H&IOW Club of the Year 2018. A great achievement by everyone at the club - from members, players, parents, coaches, volunteers and the Committee. Chairman, Margaret says “ this recognises the incredible hardwork put in over many years during our move from Brackenbury to Balksbury. All our members should be very proud of this achievement. We now go through to the Regional Round in the New Year. Good luck”. Just £25 embroidered with the club logo and personalised with the player’s name on the front. More information on the Clubhouse noticeboard or email Margaret on margaretwinnett585@msn.com. When you are next at the Club, have a look at the brand new jackets with club logo. With many colours to choose from plus they can be personalised with the player’s name on the front. For more information please email Jennie Pope on jennie.pope@merityre.co.uk or Margaret on margaretwinnett585@msn.com . Jennie Pope, captain of ALTC Sarum team, was delighted to collect the Winter League (2017-2018 season) Division 2 trophy and the summer league (2018) Division 1 trophy at the recent AGM for the Sarum League in Salisbury. It is 9 years since Andover won the summer division 1, so many congratulations are due to Jennie and her team . 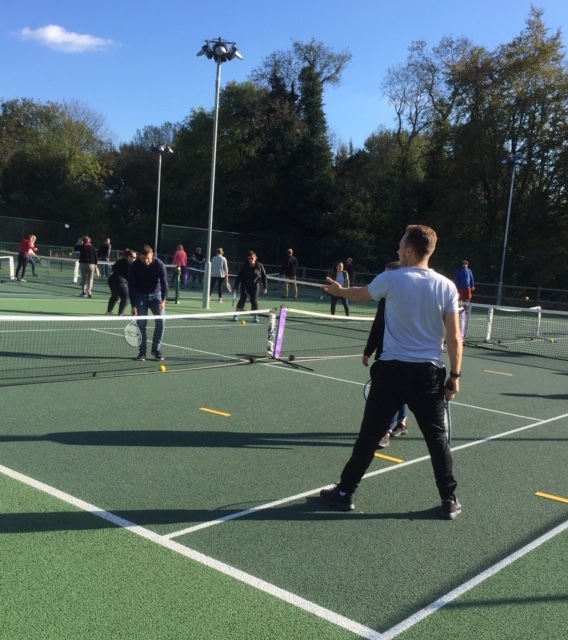 Staff from John Hanson School recently visited the club to try mini-tennis on the outdoor courts. LIzzy, Jane and Linda would like to thank all club members who attended, or donated cakes, or raffles prizes for the Macmillan Coffee Morning last month. A magnificent £1,140 was raised for this great charity. Ben has recently joined the Coaching team assisting Josh (Head Coach) to run the coaching programme. He has a wealth of experience in providing professional and fun coaching sessions. Ben is currently taking the LTA Level 3 Tennis Coach qualification. He is fully LTA accredited, first aid trained and DBS checked plus a LTA Competition Organiser. Ben looks forward to meeting you at the club soon. ALTC have a variety of teams (13 in total) in the Sarum League, Basingstoke & District League and H&IOW leagues. These include mens, ladies and mixed teams. We also have junior teams that play in the Aegon Junior League and the Basingstoke & District League. Matches take place at the weekends and weekday evenings. The teams cater for all levels of players. Please contact info@altc.net, Trevor Blake or Martyn Isherwood if you are interested in participating and representing the club. Please note, according to the League rules, only club members are permitted to play for the teams. Andover Tennis Club held their 45th Annual Club Championships last weekend. Great matches were played in glorious weather and well supported by many spectators. Thank you to everyone for making the day so memorable. Full reports are published below. The Adults Championship's full report. The Junior Championship's full report. Thank you for getting in touch! We will come back to you shortly.